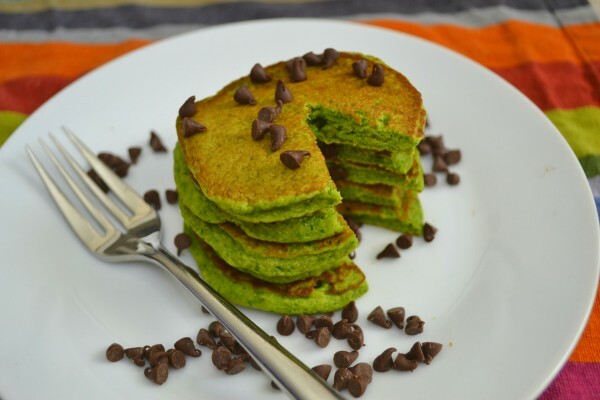 Green food coloring for St. Patrick’s Day? No thanks – especially when so many other delicious foods are already green. We’ve already gone the naturally green frosting and naturally green cake route; now it’s time to move on to breakfast. Give them a try – your kids might discover a new favorite pancake. You can find the recipe here. Note: We adapted the recipe slightly to make the batter more liquid-y by omitting one egg and increasing the milk to 1 1/2 cups. We also added 1/4 teaspoon salt because we like a tiny bit of salt in our pancakes, but that’s a personal preference. Thank you, Kitchen Cyclone, for introducing us to a new family pancake favorite!